As some of you may remember … I redid my sewing studio and had purchased some 2″ grid flannel from Nancy’s Notions… Originally I had used thumb tacks to hold it up on the wall.. well I found that this material was good for blocks but would not hold up a full pieced quilt so I had to use pins. Last week I had to run to Edmonton so with a quick trip to home depot and $14.00a sheet got me durofoam 3/4″ 4′ x 8[ rigid insulation sheet. I cut the sheet so that it would reach the roof of my room. I did this by placing the 2 sheets on the wall where I wanted them and lifted the back sheet to the roof and scored a line along the top of the front sheet. Once that was cut I rolled up some tape (only had silage tape on hand) on the back to hold it in place. Next step was to put up the pieces on the wall.. this material is extremely light… While I was doing this I washed the design wall flannel..
Once the flannel was dry it was time to re install it on the foam board… As you all know fabric shrinks… I had holes cut out for my plugs but with shrinking they were no longer aligned.. so had to extend the holes by cutting more fabric.. I used straight pins to stretch the fabric over the edges of the foam board and entered them so that they were near the wall. I did notice that the tape was not holding the board against the wall so I nailed the corners and center of the board to hold it in place. 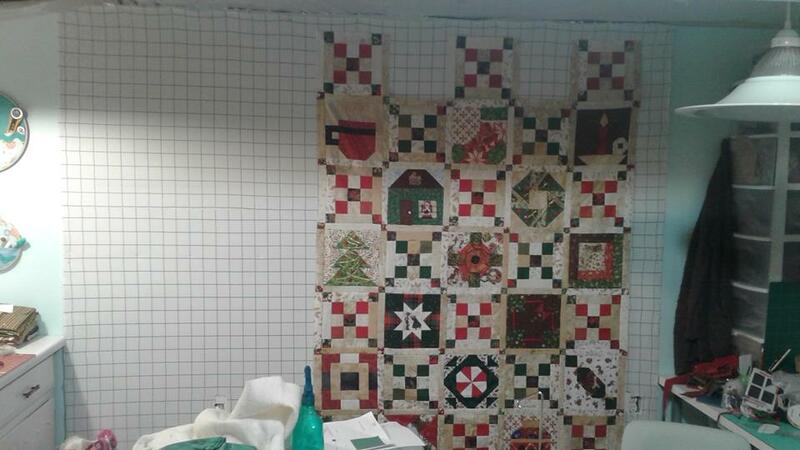 My design wall is now upgraded where I am able to put in pins to hold up assembled quilt tops.The quilt top is Pat Sloan’s Merry and Bright its a 17 week sew along. Previous Big Days Comin’…Get Some Rest.